This fantastic duplex can accommodate up to 5 people. Consists of a large open kitchen that's fully-equipped with oven, dishwasher, fridge, etc. There is a dining room, 3 bathrooms (two of them en-suite) and three bedrooms (one double bedroom, one twin bedroom with bunk bed, and one single). There is also an extra storage room. The highlight of this apartment is its huge terrace of 130 m² equipped with sun loungers, outdoor table with chairs and a ping pong table. 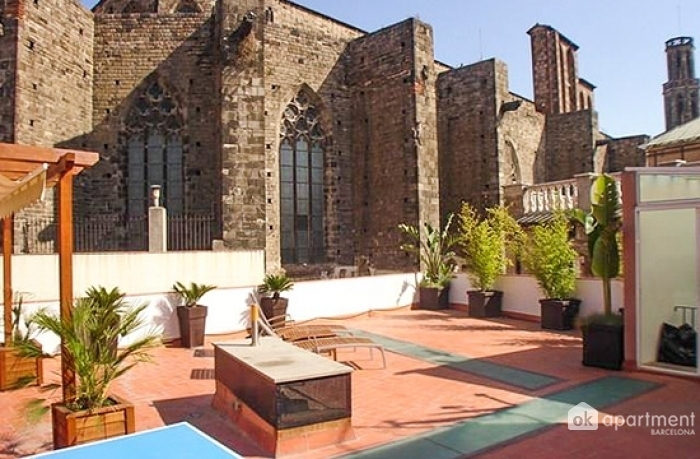 This terrace features unique privileged views of the Catalan Gothic Santa Maria del Mar Church. Ideal for children and young people! The location of this apartment rental is great, literally next to the beautiful Santa María del Mar Church in the heart of the Born district. You'll be surrounded by cosy cafes, restaurants and designer shops, all while staying in the centre of Barcelona. 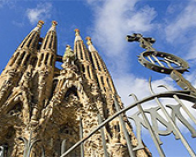 It's easy to walk to Plaza Catalunya or Barceloneta beach, in addition to the numerous attractions nearby such as the Picasso Museum and Arc de Triomf. The nearest metro station is Jaume I (L4). Included in price: Cot (under request),	Bedlinen,	Private table tennis. Upon receiving the apartment keys you will be asked to pay a deposit of € 6400.